As a Montgomery County Commissioner of Precinct 2 hopeful, Brian Dawson understands that hard work pays off and savings make rainy days bearable. To embrace all that Montgomery County has going for it, he has a plan to make the county stronge by developing a mobility plan that starts with improved intersection upgrades and maximizes every partnership dollar available to the county. Further, he will stabilize Montgomery County's fiscal responsibility to its taxpayers with zero-based budgeting, implementing stricter spending controls and halting the current tax-and-spend policy. He will also insist on smart growth with a needs-based growth plan, embracing and partnering with developers to maximize freer mobility throughout the county and ceasing reactive governing to growth challenges. But, much of it is up to the residents of Montgomery County and the voters of Precinct 2. He needs your support to make this plan for hard work to work for you. 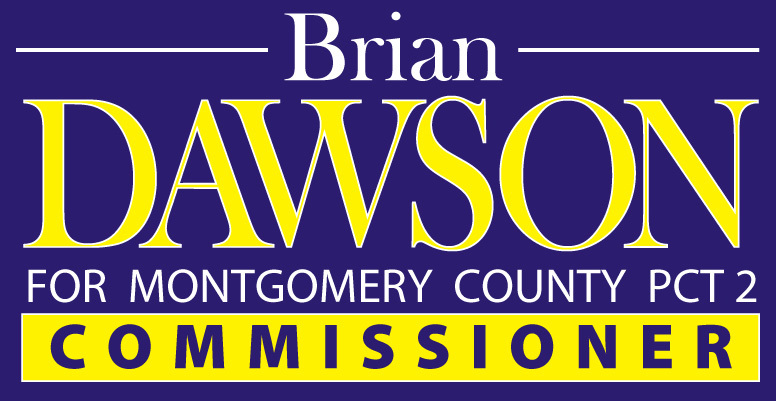 Please consider making a contribution to invest in a viable and forward-moving Montgomery County. Your help is necessary and will be appreciated. $2,500 - Let me invest in the Overall Campaign! POLITICAL ADVERTISING PAID FOR BY BRIAN DAWSON CAMPAIGN.